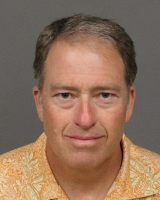 A San Luis Obispo judge ruled last week that enough evidence exists for a manslaughter case against the owner and former administrator of the Manse on Marsh to go to trial. Last July, the California Attorney General’s Office filed charges of involuntary manslaughter and elderly and dependent abuse against Christopher E. Skiff, 54, and Gary Potts, 63. Skiff, the owner of the Manse on Marsh, and Potts, a former employee, are accused of knowingly and willfully endangering Mauricio Edgar Cardenas, 65, and ultimately causing his death. In Dec. 2014, Cardenas was attempting to cross Los Osos Valley Road in Los Osos when he was hit and killed by a 2010 Dodge Challenger. The CHP determined the driver was unable to avoid Cardenas because of the darkness at the location the pedestrian was crossing. On Friday, a preliminary hearing that stretched out over several months concluded with a judge deciding there is enough evidence for both Skiff and Potts to stand trial. Prosecutors allege the Manse on March admitted Cardenas as a resident, even though he had a dementia diagnosis and the facility lacked a waiver to handle such patients. The Manse on Marsh has previously been cited several times for admitting residents for whom it was not licensed to provide care. One of the prosecution’s witnesses, special agent Sherry Zamanigan, an investigator for the state Department of Justice, stated in a sworn affidavit that the Manse on Marsh regularly accepted elderly residents with conditions the facility was not licensed to care for. That exposed the patients to circumstances in which they could likely suffer great bodily injury or death, Zamanigan said. Zamanigan stated in the affidavit that she interviewed former Manse on Marsh employees who said there were numerous dementia-diagnosed residents at the facility and that workers would ask residents’ doctors to change their diagnoses so they could stay at the facility. Manse on Marsh is accused of having taken in unfit patients in order to fill beds and maximize revenue. Skiff and Potts are due to return to San Luis Obispo Superior Court on Monday.